Why does government work so well? Huh? In this post on EconLog, Bryan Caplan explores why government enterprises work so well. I think the small-government types (like myself) can overplay disasters of government involvement and we lose credibility when we do so. So, I do think its helpful to recognize when government seems to be doing, at worst, okay. On the flip-side, I think big-government types can overplay the successes of government enterprises. But, I think much of this is explained to the extent of what level of government we are talking about and the dynamics of that level, to what extent it is bottom-up or top-down. I discussed this in more detail in this post back in 2013. I think government enterprises that work pretty well are more bottom-up and the ones that don’t work so well are top-down. That post was inspired by an apples-and-oranges comparison often made by government-types. They say that fire and police departments are government, and work pretty good. Then they make the logical leap to use this to support that some Federal government enterprise will work. The lapse in that logic is that fire and police departments, while government enterprises, operate at the local level. There are thousands of these departments, that operate rather independently of one another, across our country. This makes these enterprises operate much more like a bottom-up organization, than top-down. This allows these enterprises to benefit from the same dynamics of innovationism as businesses. I enjoyed listening to this EconTalk podcast with guest Lant Pritchett about education, specifically in poorer countries. I recommend it. …the basic distinction is between a top down organization where the metaphor of a spider is, all of the resources of the spider web, however spread out they are, merely serve to transmit information to one spider, who synthesizes that information and responds with the resources of the system. So, if there is a bug, the spider crawls out and gets it. But kind of all the web is kind of an ancillary to the brains of the top. The starfish is a creature that actually has no brain. 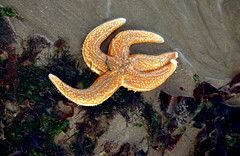 It’s neurally connected, but a starfish moves because the individual units of the starfish sense something and if they sense more food they try and pull that way. And if the other side isn’t pulling as hard, the starfish moves. So it’s really a metaphor of a decentralized system, where individual units responding to local conditions create the properties of the system. And the beauty of a starfish is if you cut a starfish up into 5 bits, you get 5 starfish. The danger of a spider is that when the spider dies, it’s dead. The whole system therefore falls into dysfunction [single point of failure]. …one of the conjectures I put in the book is that it persists partly by camouflage. It pretends to be something it’s not and then can project enough of the camouflage that it maintains its legitimacy. So, sociologists of organization have a term called ‘isomorphic mimicry’, which is adapted from evolution where some species of snakes look poisonous but aren’t, but get the survival value of looking poisonous. So, one of the things that’s happened is by this pressure to expand schooling and by the governments’ desire to control that socialization process, they have created all the appearances of schools that provide education but without actually doing it. But have at the same time not produced the information that would make it clear that they weren’t doing it. So they produce enrollment statistics, numbers of buildings, numbers of toilets, numbers of textbooks, numbers of everything. But have, you know, all of which can project the image that there’s a functional system and providing real learning there. But they don’tprovide metrics of learning or incentives for learning or feedback on learning or accountability for learning at all. You know, the United States has always been much more of a starfish system. And the starfish system has enormous strengths, and I think those enormous strengths have led America to be a leader in education in many ways. And one of the examples I use in my book is, if there’s a scaled example of a starfish education system, it’s American universities. And it’s just unbelievable from the data the extent to which America dominates quality universities. It’s just unbelievable compared to Europe, which always took the same approach to universities that other countries want to take to their basic education. And you see the consequences of it. America’s universities–in the book I have numbers of the top 200 universities in the world, what fraction of them are in Anglo countries, and it’s just way disproportional to the population size. And even wealth. Because Europe, which is equally sized and equally wealthy, continental Europe, just has nowhere near. And it’s the result of a starfish system, in my view. I’ve made the same point several times on this blog. Here and here are a couple of examples. I do appreciate the spider and starfish metaphors. Those roll-off the tongue better than top-down and bottom-up.